The PKI 7260 is a heavy duty, conveyorised X-Ray Security Screening System designed for screening cargo and large luggage, detecting concealed weapons, explosives, narcotics, foreign currencies, contraband goods or manifest frauds. Featuring an opening of max. 100 x 80 cm and an endless conveyor belt, this device perfectly matches the requirements of professional users. 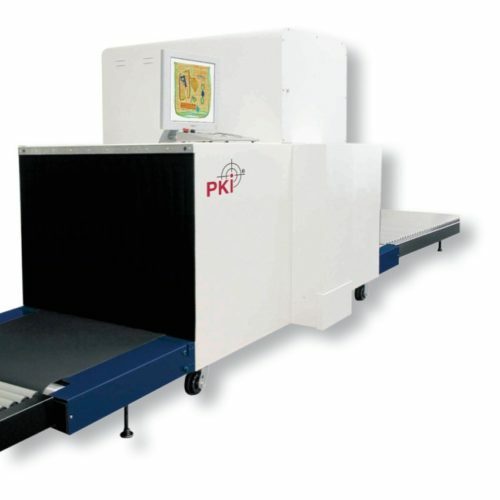 PKI 7260 should be used at any airport, rail or bus station, government facility, loading dock, customs office, nuclear power station, hospital or wherever suspicious luggage or parcels may occur. X-Ray Detectors: Surface-mounted, fully integrated, high frequency, solid state detectors using high speed processors and advanced Pentium 4 processing with multi-energy. Video: the standard system comes with a high resolution, flicker-free and low radiation 17″ SVGA display with 1280 x 1024 pixels.